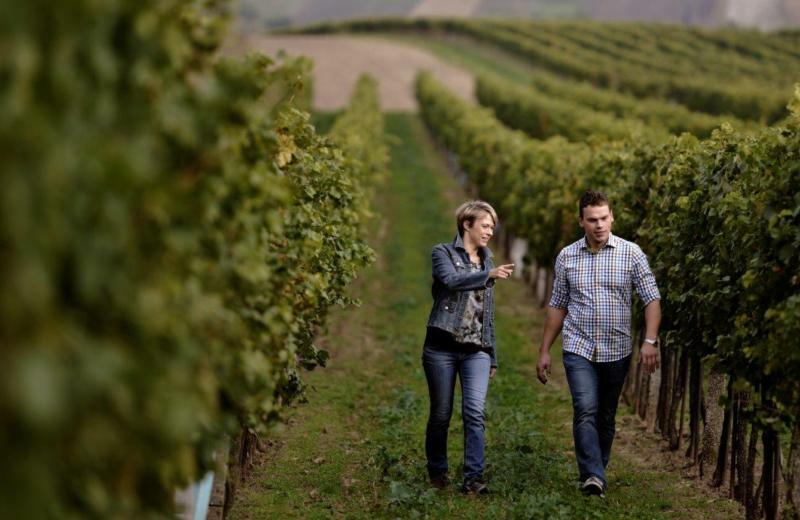 This young, family-run winery is located in the north-east of Austria, in Ketzelsdorf-Poysdorf. The owners, Sylvia and Martin Hugl, make use of the experience of their parents and combine it with their know-how and modern techniques to create high-quality wines. They combined their family estates, Hugl and Wimmer, with the 2013 vintage. Their main focus is on Grüner Veltliner in all its diversity. Their goal is to produce easy-drinking wines suitable for every occasion, with fruity, fresh white wines and elegant, classic red wines. Martin graduated from the AGRO-HAK Agricultural College and subsequently studied at the University of Applied Sciences for International Business Relations. Since 2007 he has been responsible for quality control in the vineyards and for wine-making and he is the first point of contact for sales. Sylvia graduated from the HBLA for Wine and Fruit Production at Klosterneuburg and subsequently studied Tourism at Vienna Business University. Sylvia is responsible for tastings, marketing and accounting, although her first priority lies with daughters, Valerie and Helena, who like to be involved in everything. Hugl Weine's vineyards are located within a 2 km (1.2 mi) radius around the town of Poysdorf. Even though the vineyards are close to each other, there are many different soil types. The terroir of the vineyards ranges from light, sandy soils in the more northerly sites, to medium loam soils and deep-seated loess and loam soils. The different vineyard locations allow Hugl to produce a broad range of grape varieties. Even the character of Grüner Veltliner is strongly influenced by the type, as well as the depth of the soil. In addition to using the best cellar technologies, they emphasize the work in the vineyards and the soils. Prime south- and south-west-facing hillsides and the loam soil, ideally suited for wine growing, are the basic conditions for high quality. They own and cultivate 22 hectares (54.3 acres) of vineyards and cooperate additionally with several partners who are cultivating grapes according to their quality targets. They buy grapes from 25 hectares (61.8 acres) of vineyards.